We're pretty good at using surgery to keep people alive. But at a certain point, doctors are only human—hands shake, surgeons get tired, sutures and stitches are done imperfectly, wrists can only twist so far. That's why, in recent years, surgeons have used robots more frequently, to direct tools inside a patient more perfectly than a human could. 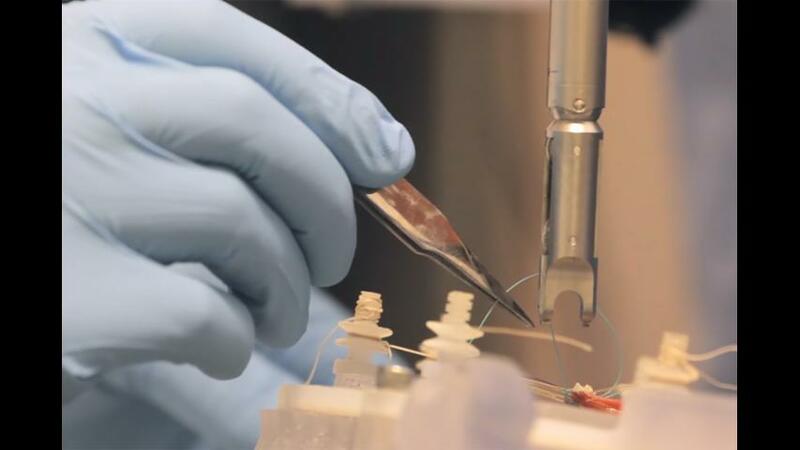 Now researchers have developed a robotic surgical tool that can operate autonomously on soft tissue, according to a study published today in Science Translational Medicine. In the past, autonomous surgical robots have only been used on the body's hard tissues, such as to cut into or reset bone. But when it comes to soft tissue, robots have typically been directed by a human surgeon using manual controls, much like a more precise version of an arcade claw machine game. That's because soft tissue is "unpredictable, elastic, and plastic," as the surgeons write—your body is mostly a mass of sloshy, movable goop, making it nearly impossible for computers to plan exactly where to make their cuts and stitches. To work around this, the researchers developeda new way for the robot to "see" the tissue it would be cutting. The system they created, called Smart Tissue Autonomous Robot or STAR, uses biomarkers that show up clearly on the systems' near-infrared 3D imaging tool. Researchers inject a chemical that makes certain spots on the tissue fluoresce, then a suturing tool attached to a robot arm can stitch it up, moving in eight directions. If something were to go wrong, the human surgeon would be able to pull out the robot and continue the surgery as usual. "In a situation in which something critical is going on, the surgeon would be closely monitoring the robot. I'm sure that they wouldn't feel comfortable having it run and go take a coffee break," Ryan Decker, one of the study authors, said yesterday in a press conference. "If something goes wrong, it's just a finger press away from stopping the robot and taking it out of the surgery and proceeding as you would normally, in a normal surgery." As autonomous surgeries become more common in a clinical setting, there's a chance that surgeons could forget how to perform surgery, as has happened with airplane pilots who no longer know how to override the autopilot. In this proof-of-concept study, the STAR system stitched together two parts of a pig's colon. The researchers likened this task to reconnecting a cut garden hose—and just like the hose, if the stitching is done imperfectly, the colon can be prone to leaks that can be life-threatening. Using the vision system and a pressure sensor at the end of the robotic arm, the STAR tool automatically placed sutures in the tissue to reconnect it, both in tissue in the lab and inside living pigs. The researchers then compared the STAR's performance to that of a surgeon performing the same task with a laparoscopic tool as well as a robot-assisted surgery in which the surgeon controls the robot. Comparing the uniformity of the sutures, number of mistakes and the highest pressure that the tissue could withstand without leaking, the STAR system performed better than the human and the human-directed robot. None of the living pigs had any complications from the operations. Part of the goal of autonomous surgery is that it could reduce complications. Given the precision with which the STAR system performed these tasks, it could likely do this in a clinical setting. "Our goal is not to replace surgeons. By making tools more intelligent, we can improve [patient] outcomes," said Peter Kim, a surgeon and senior author on the study, also in the press conference. These sophisticated surgical systems aren't as widespread as you might think, mostly because they are so expensive, in some cases prohibitively so. Because the STAR system is mostly made of tools that are already approved by the FDA, the researchers say it would simply be an add-on to currently available surgical technology (though they have developed some proprietary technology—the researchers have already been awarded one patent and have filed a handful of others). Ideally, autonomous robots could also do surgeries more quickly, freeing up limited space and surgeons' attention to perform more surgeries per day. As it stands now, the STAR system can't do this—it took about 50 minutes on average, longer than the human surgeons and the non-autonomous robot. The researchers plan to improve this in future iterations. Before autonomous surgical robots can be used in places as diverse as developing countries or even in space, the researchers need to make sure the tools can be used for other soft-tissue procedures, such as removing tumors or gallbladders. The researchers believe this is fully possible—they anticipate that it could make its way to the clinic in the next two to three years. The post Autonomous Robot Surgeon Just Outperformed Human Surgeon appeared first on Vocativ.